This is a quick lesson on ABGs, which is a very useful skill in medicine. If you know how to interpret ABGs, you’ll be able to correlate clinical manifestations of a patient with the underlying diseases that cause acid-base disturbances. I have incorporated jpeg images of the PowerPoint presentation I made on the topic together with some explanations. …you go to your post at the Medical Intensive Care Unit. There you have patient A.B., who is intubated. He is 79 years old and has chronic kidney disease. He was admitted because of 4 days duration of fever and had difficulty of breathing one day prior to admission. You remembered that he was tachypneic on admission. Being the proactive intern, you tell yourself that you need to know what the patient’s CO2, O2, and HCO3- levels in the blood are so that you’ll have a picture of what is going on with him and what management is to be done. So you decided to check the patient’s chart, and there you find the ABGs that you needed. The next thing to do would be to interpret the values you see on paper. Before clerkship, I used to have a hard time with these, mostly because I didn’t care to practice it very often. However when I got to face the real deal during clerkship, it became very clear to me that ABG interpretation is a very important skill in medicine. To start off, it’s important to know what is normal. 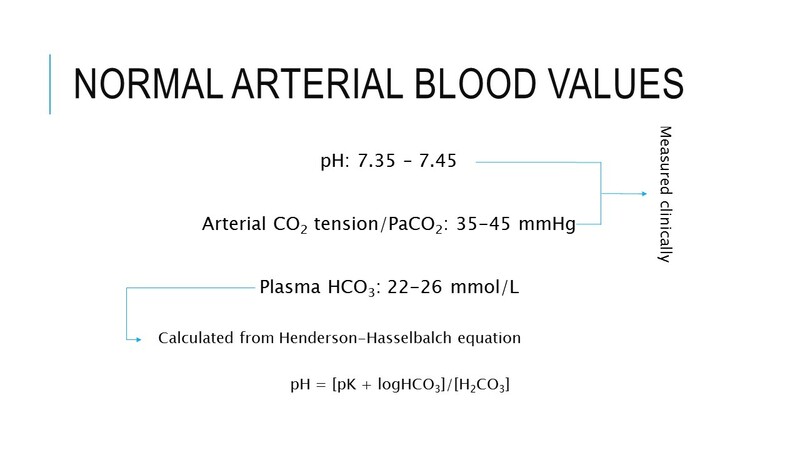 Below you will see the normal arterial blood values which a healthy patient will have. A deviation from these values will cause an acid-base disturbance. If the blood pH is below normal then the patient is acidotic. If the blood pH is above normal then the patient is alkalotic. However, a normal blood pH does not always mean the absence of acid-base disturbances, as we shall see later. So what causes these blood pH changes? Simply put, it is due to the changes in the concentration of CO2 and HCO3 in the body. These two compounds are used by the body’s pH bufferring system. The body’s pH buffering system works in a way that CO2 & H2O react to form Carbonic Acid (H2CO3), which can then dissociate into Hydrogen ion (H+) and Bicarbonate (HCO3-). Excess Carbon dioxide (CO2) can cause this process to shift to the right, which means there is more Hydrogen ion (H+) production, hence blood becomes ACIDOTIC. If Bicarbonate concentration in the blood decreases, you also have ACIDOSIS because the equation is still shifted to the right. Our body wants to produce more bicarbonate as a response and in this process, H+ will also increase. Increase in bicarbonate will cause the equation to shift to the left, resulting in decrease in H+. Clinically, this presents as ALKALOSIS.The same thing is observed when the CO2 concentration decreases, since HCO3- and H+ combine to form more CO2 (shift the equation to the left), which then decreases the H+ concentration in the bloood. Decrease in H+ is seen as decrease in blood pH. #ThinkOfThis: What conditions cause changes in bicarbonate levels in the body? Which scenarios would cause a patient’s CO2 level to go down? Acid-base disorders can either be simple or mixed. In simple acid-base disorders, you clearly see that the blood pH is abnormal. In mixed disturbances however there is more than one acid-base disturbance independently coexisting in the patient. The pH can be normal since there is an abnormality in both the CO2 and HCO3- concentrations occurring at the same time. To approach the problem systematically, you can follow the steps outlined below. To determine the Primary disturbance, you first look at the pH. Remember that if the pH is below normal range (7.35-7.45) then there is acidosis, and above this there is alkalosis. If you’re lucky and the case is clean cut then you’ll see that only one of either CO2 or HCO3- is not within normal range and in this case it’s easy to determine the primary disturbance. Simply put if the pH is acidic and CO2 concentration is increased while HCO3- is normal, then there is respiratory acidosis. etc. etc. etc. There are also cases in which the pH appears normal but you notice that the concentration of either CO2 or HCO3- is not within normal. Here you will still have to compute for delta or change in CO2 or HCO3-. Briefly, the blood pH in these patients appear normal because there might have been changes in both [CO2] and [HCO3-], creating acidosis and alkalosis simultaneously in one patient. There is always a compensatory response for any primary acid-base disturbance. 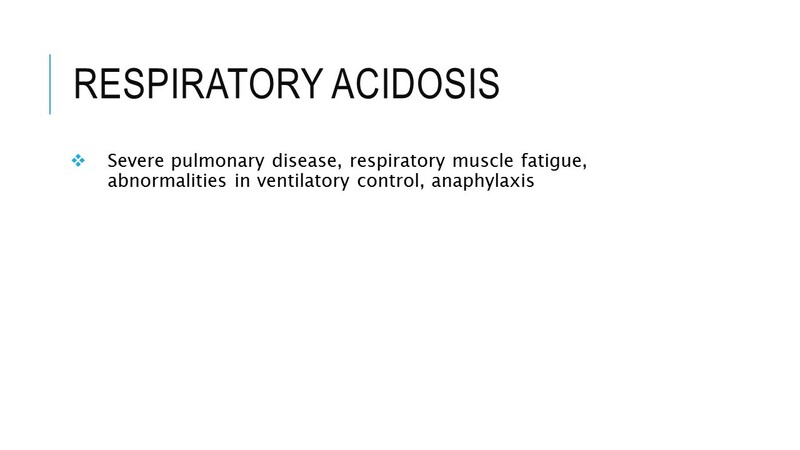 If you have respiratory acidosis, the kidneys compensate by allowing for increase in HCO3- concentration. 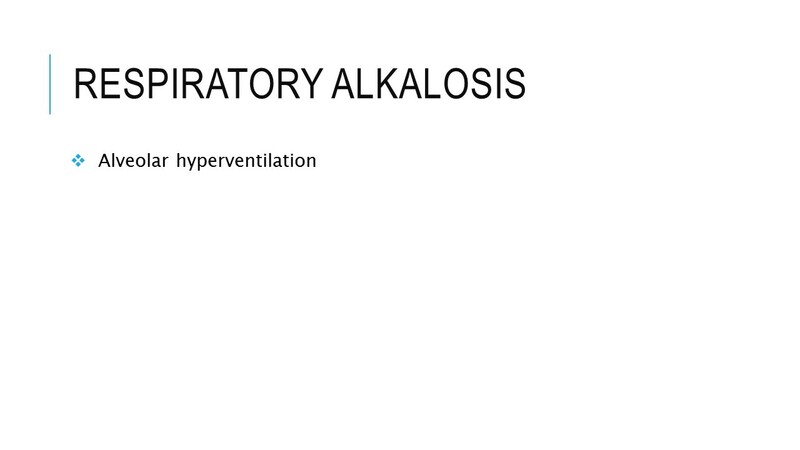 If there is respiratory alkalosis, then there is also a corresponding decrease in HCO3-. The same principle applies for both metabolic acidosis and alkalosis. However, there are times wherein the compensatory responses are not enough. In these cases, there is a concomitant secondary acid-base disturbance. In other words, if for example you were expecting the HCO3- concentration to decrease up to a certain amount but on ABG extraction you found that the actual level was well above this predicted compensation, then there probably is a concomitant secondary acid-base disturbance. Scientists have already made life easy for us. They have already formulated equations that would let us compute for the compensation in acid-base disturbances. We can use these equations to know the predicted concentration of CO2 or HCO3- in response to a particular acid-base disturbance. You might notice that after doing the math, the range of values for the predicted compensation does not include the actual value seen in your patient. This means that your patient has a mixed disturbance. 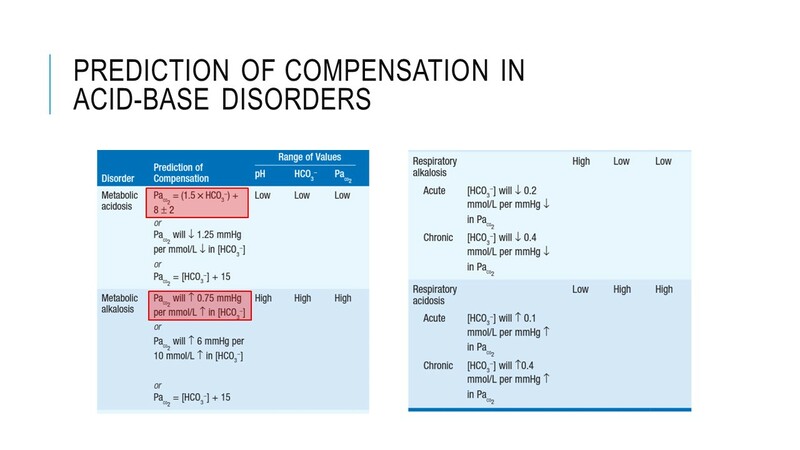 If your patient has respiratory acidosis and after doing the computation you find that the HCO3- level is below the expected compensation, then the patient has an accompanying metabolic acidosis. Here you will observe that the blood pH of the patient is very low since there are two acidotic processes going on concomitantly. If however the HCO3- is above the expected compensation then there is accompanying secondary metabolic alkalosis. Here the patient’s pH may appear normal. 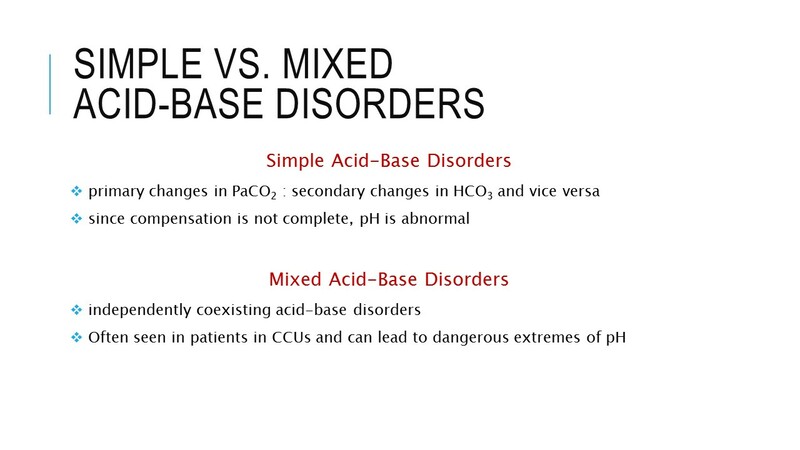 Mixed Acid-Base disturbances are often seen in ICU/CCU settings and lead to extremes of pH. For example in a patient with diabetic ketoacidosis, aside from metabolic acidosis there may be a coexisting respiratory acidosis or alkalosis if the patient develops pneumonia. An important and kinda confusing step in ABG determination is the AG calculation. What is an Anion Gap anyway? Recall that the major extracellular ions are Na+, Cl-, and HCO3-. The rest of the anions (negatively charged) and cations (positively charged ions) in the blood are not routinely measured at the hospital setting, but we however assume that they are found in equal amounts since blood has no charge. The Anion Gap represents the unmeasured anions in the blood, which include albumin, sulfate and phosphate. In the formula for Anion Gap calculation, we only take into consideration Na+, Cl-, and HCO3- since these are the major extracellular ions. So literally the name means that there is an anion gap because the computed anions in this equation will always be less than the cations since we weren’t able to include all the anions in our equation. However there is only a certain range of values wherein the gap is considered normal. Beyond this, we say the there is High Anion Gap. So what now if there is High AG? If your patient has metabolic acidosis, then obtaining the AG will tell you what kind of metabolic acidosis there is. 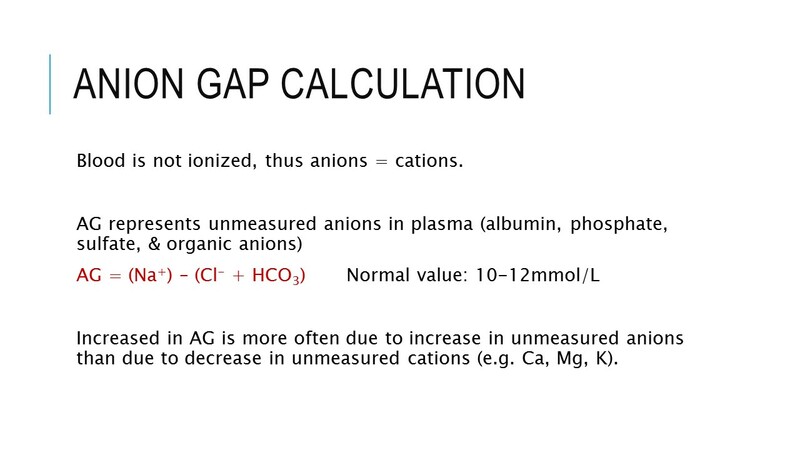 Metabolic acidosis can either have a high anion gap or a non-anion/normal anion gap. The anions we can find in the blood include albumin, phosphate, sulfate, and organic anions. However certain conditions can cause an increase in the anions in blood plasma. These include lactic acidosis after a patient develops circulatory shock, alcohol and diabetic ketoacidosis, salicylate intoxication, methanol ingestion, and renal failure. 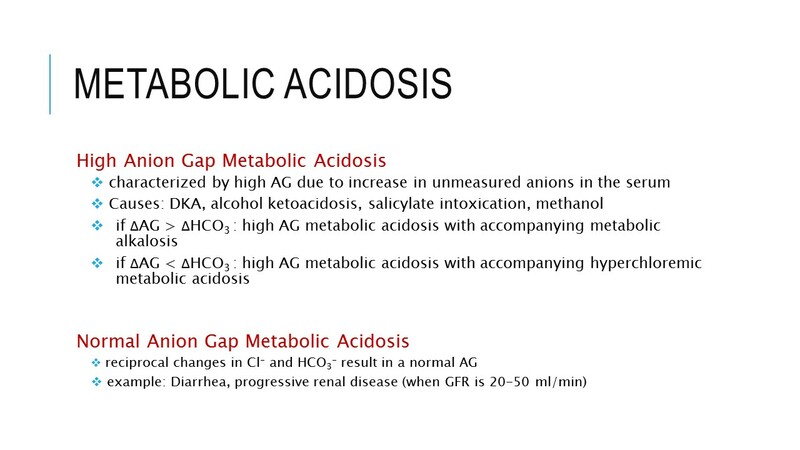 Normal anion gap metabolic acidosis occurs when there is HCO3- losses, example during diarrhea or renal tubular acidosis. This is accompanied by an increase in Cl-, hence it is also called hyperchloremic metabolic acidosis. Another interesting information you can get by computing the AG is seen when we compare change in AG with change in HCO3-. The increase in AG is equal to the decrease in HCO3-. The acidosis is due solely to the increase in unmeasured anions. When ∆AG>∆HCO3- , aside from HAGMA, there is also accompanying metabolic alkalosis. This makes sense because when you recall the formula for AG, a decrease in HCO3- should result to an equal increase in AG. However if the increase in AG is more than that of the decrease in HCO3-, then that means there is another coexisting disturbance that caused an increase in bicarbonate (thus there is accompanying metabolic alkalosis). Although there was a greater decrease in [HCO3-], a reciprocal increase in [Cl-] caused the anion gap to not increase as much. This is commonly seen in conditions such as diarrhea and renal tubular acidosis, where there is hyperchloremic metabolic acidosis. The decrease in bicarbonate is equal to the increase in chloride ions. The acidosis is solely due to increase in chloride ions. When ∆Cl>∆HCO3- , aside from NAGMA, there is also accompanying metabolic alkalosis. The increase in chloride ions exceeded the decrease in bicarbonate. However AG still remains normal since an accompanying metabolic alkalosis counteracts the decrease in bicarbonate. When ∆Cl<∆HCO3- , aside from NAGMA, there is also accompanying HAGMA. The decrease in bicarbonate exceeded that of the increase in chloride. Aside from a NAGMA characterized by an increase in Chloride ions and decrease in bicarbonate, there is another process occurring concomitantly that decreases the bicarbonate concentration even more. And since there are only 2 types of Metabolic acidosis, and this other one did not increase chloride concentration, then the process must therefore be HAGMA; hence there is concomitant HAGMA aside from the NAGMA. 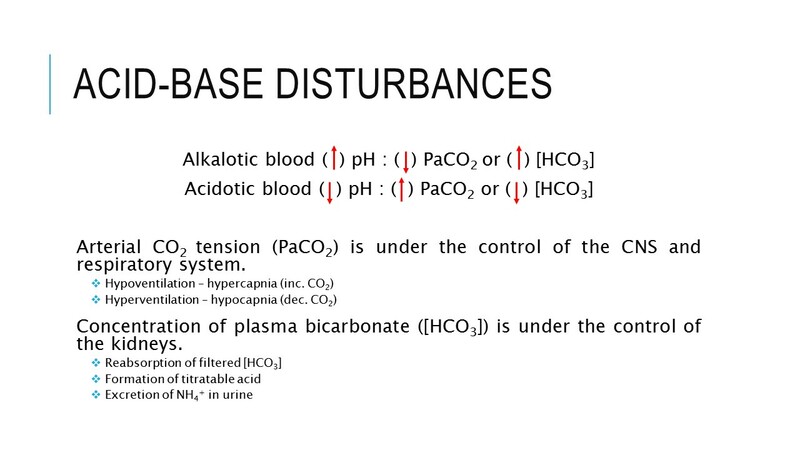 The following are the common causes of the remaining acid-base disturbances. Metabolic Acidosis has already been discussed above. Metabolic alkalosis can occur in vomiting when bicarbonates are lost. 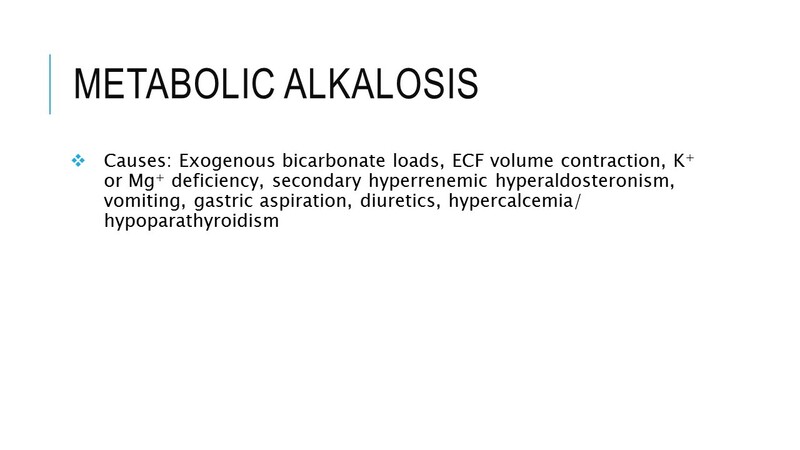 In a patient with alcoholic ketoacidosis who happens to be vomiting a lot, high AG metabolic acidosis with accompanying metabolic alkalosis can occur. Respiratory acidosis occurs when carbon dioxide is not blown off appropriately. This can be seen in patients with COPD or pneumonia. Respiratory alkalosis on the other hand, is seen when there is decreased carbon dioxide in the blood when the patient is hyperventilating. This occurs in anxiety and may also occur in patients with pneumonia or bronchial asthma in acute exacerbation.